A great test tonight, Gator Nation. On the road again at Missouri which promises to be more exciting than our game at Auburn. Missouri has been the tale of two teams. On the road they have been completely demolished (including an 83-52 shellacking at Gainesville). At home it is quite a different story. 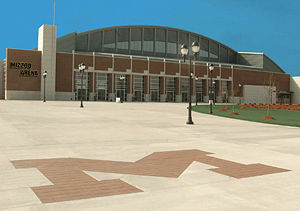 They are 14-0 at Mizzou Arena and completely dominated Ole Miss, Miss State, Alabama and Vandy. “What?! ?” I hear you say. “So have we?! ?” Of course, we have, but that is not the point. The point is that we are facing a much different team than we did a month ago at home. One that could provide a much needed test for our Gator basketball team. Last time we played they had just lost Laurence Bowers who was the heart and soul of their team. He’s back this time around and they have an explosive offense to go with it. They have six players averaging double figures. They are also #2 in the nation of rebounding. It is also unlikely that their point guard, Paul Pressey, will have the same 10 turnovers he did last time….though I’m still counting on Scottie Wilbiken to shut him down. It’s going to be a closer game and it’s going to be good. We need a battle on the road to test our mettle and to really see if the Gators learned something from that Arkansas game. Mizzou is going to come out with guns a blazin’ and they are going to try and amp up the crowd with some high intensity offense. It will be good to see how the Gator defense can react to an initial blitz and if they can completely shut them down again. I don’t really like close games any more than the next Gator fanatic, but the truth is leading up to the SEC and NCAA tournament, we need some on the court tests away from home. 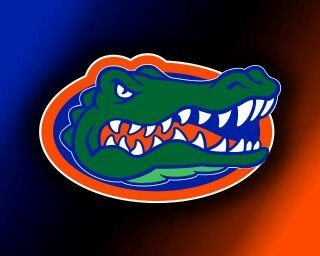 It might cause misfirings of some pacemakers, but when it is all said and done, I believe this Gator team will prevail. They’ve come a very long way this year and have matured quite well as the season rolled along. Now, it must be said, that being without Yeugete tonight will be difficult. Missouri brings Alex Oriakhi in with almost 9 rebounds a game to go with his 6’9″, 260lb frame. Will Yuegete is a great equalizer there. We’ve seen Casey Prather and Michael Frazier II step up in recent games. Tonight will be a much interesting assignment for both. They do not have to have monster nights, but if Prather can battle down low and grab some more rebounds and MFII can nail 2 or 3 three-point shots, then they will add a consistency to an already steadily performing team. It’s not about being all-stars…it’s all about team contribution and working together. This has been one of the best seasons ever to watch because this Gator team has serious chemistry and really likes going out and lacing them up and getting on the court. If someone is down, another steps up. It is great to watch. Who would have ever thought we would have Kenny Boynton around 13 points per game instead of 16…and still clobbering teams. The fact is he doesn’t have to do it alone anymore. His assists per game are up and he is still a legitimate threat from the outside. Just having him on the floor puts enormous pressure on the opposing team. An opponent, quite frankly, has to account for every Gator on the floor including those off the bench. Plain and simple. It’s a late game tonight, but well worth staying up and watching….or at least put it on the DVR and watch it tomorrow. This has been an exciting season and one you will want to see through to the end. This entry was posted in Uncategorized and tagged Casey Prather, Florida Gators, Gator, Kenny Boynton, Michael Frazier II, Missouri, Mizzou Arena, Paul Pressey, scottie wilbiken, University of Florida, Will Yuegete on February 19, 2013 by TheGatorNarrator. It’s all about the game, Gator Nation. Florida State is getting credit for having one of the best defensive units we’ve seen this year, but that is a bit misleading as they’ve only played one top ranked team in Clemson and they scored 37 on them. Of course, you don’t really have to be a top ranked defense to shut down our offense, but we will get to that. FSU has probably the most potent offense we have seen this year, probably on par with Georgia. Their QB, EJ Manual, has had some stellar games this year. While our pass rush could use drastic improvement, our secondary can’t give him any easy targets and we will have to shut down their running game of Chris Thompson and Devonta Freeman, who have about 1,300 yards between them. We don’t have a choice today, we have to shut down the run game, otherwise this will get very ugly…but I’ll get to that later as well. Let’s just get to the nuts and bolts of it all. No one thinks we are going to win in Tallahassee because we can’t score on offense against really bad teams and FSU will have the best defense we have seen all season (though I have some arguments with that). We are not favored and not expected to win even though we are ranked #4 in the BCS and are 10-1 against the hardest schedule as rated by the NCAA in the nation. Heck, not even sure why we are even getting on the bus for this game as this is a formality. Let’s just get to the post-game hullabaloo. You’ll have to excuse me if I haven’t given up just yet. Let me face a few facts up front. We scored one offensive touchdown in each of the last three games against very poor defenses. We’ve relied on our Field Goal kicking and defensive turnovers to generate our offense this year. We can run the ball when our offensive line plays well, but that hasn’t happened lately. We must hold on to the ball to win. All of this would be disconcerting were it not for the fact that we’re somehow 10-1 against superior teams. No matter what the stats say, we can win this game, but the defense must show up and we must force a bunch of turnovers. A Gator defensive or special teams TD might not hurt either, but we must knock the FSU offense around from start to finish. If our defense is as highly touted as we think they have to make an impact today of epic proportions. We can’t have a solid effort from them…we have to have a phenomenal effort from them. I don’t even think I’m asking anything remotely impossible. Our defense is good enough to have a day like this. It is against our main rival in a game with huge repercussions for whoever wins. It comes down to preparation and concentration, but I’m banking on the Florida Gators just having a ton of “want to” for this game. They want to win to prove to everyone that they belong where they do. Florida 17 Florida State 13. Game time is 3:30pm EST, 12:30pm PST on ABC TV. I want a special teams AND defensive TD by the Gators today with of course, a FG. While our Gator Club has to meet at a fellow Gators’ home today because of some other rivalry game here in Columbus, Ohio, I hope you are able to join your local Gator Club where a Victory over the Seminoles is best served with Gators! ‘Nuff said. This entry was posted in Uncategorized and tagged Bowl Championship Series, Florida Gators, Florida State University, FSU, Gator, Seminole, University of Florida on November 24, 2012 by TheGatorNarrator. 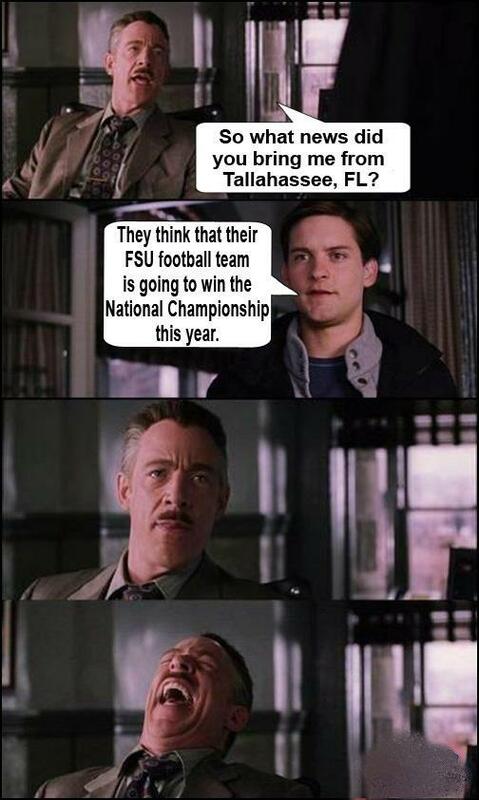 Courtesy of the I Hate FSU page on Facebook. A quick and dirty on this weekend, Gator Nation! I love the shutout, but I fear it was more to do with UK’s inept offense than our defense. We had several blown coverage plays that could have netted the Wildcats points, but they were unable to capitalize. Not having their starting QB didn’t help either. Still….gotta like a shutout. I’m a big fan of Mike Gillilslee. Throughout the years he has been a model of consistency and professionalism. I’m hoping he does get 1500 yards this year and 24 TDs. That said…Matt Jones will be the future of the Gator ground game. Sorry, Mack Brown. Offense needs to get on track quicker in the SEC games. If we want to beat LSU next week, this is imperative. I think our defense can contain LSU’s offense, but we need to score on them consistently throughout the game. Not in just the second half. We’re +5 in turnover ratio. We’re heading in a good direction on this stat. I’m disappointed that Jacoby Brissett did not get a chance to pass the ball at all. If the offensive line were better, it might be him out there instead of Driskell. On the flip side, I also understand why Muschamp is running the ball as much as he is. He’ll win far more games with a good running attack than just passing. I can’t believe that Jordan Reed took that hit and immediately bounced right back up. I hurt all over after that play and I’m 7000 miles away. I don’t think he’ll be able to do that against LSU, UGA, SoCar and the rest. Despite the shutout and 38 points scored, I’m sensing that this team is far more focused and sharper when they are on the road. That game on Saturday lacked a lot of intensity on our sidelines. Kentucky‘s pass rush is nothing compared to LSU’s. Driskell holds the ball too long. He will not be able to scramble as well against LSU’s speed. Our rushing game has to pick up yardage in two weeks. Jordan Reed likes to hop up and make catches. He doesn’t run his routes very well. He makes beautiful catches though. I’ll take ’em, but he could be infinitely better. We gave up 150 yards on the ground to UK—a team that couldn’t get to 50 against WKU. I’m thinking we will need to do better than that in October. Zero fourth quarter points allowed so far this year by our defense. Nice! One sack by the defense. Not so nice. Might be an odd time for a bye week this week, but one thing is for sure, we will have more healthy players available for LSU than we did last year. I’d always prefer the bye week before UGA—-mainly because Spurrier liked it that way. Can’t say that I’m agreeable to the timing, but I’ll take it this year. Hope the administrators see fit to putting that bye week back in front of UGA. Last, but certainly not the least, if you want to taunt that ‘Nole fan who is always nearby, let them know that no one has ever won the National Championship and given up more than 35 points in a regular season game—EVER! Then tell them the score of their game this past weekend. Buuwahahahahaahah (evil laugh onomatopoeia). This entry was posted in Uncategorized and tagged Florida, Gator, Kentucky, LSU, Southeastern Conference, University of Florida on September 24, 2012 by TheGatorNarrator. Got this off the internet somewhere—but can’t remember who gets credit. Go Gators! Control your destiny, Gator Nation! Those are great words that absolutely have zero meaning for me here in the desert. Very little of what goes on here am I able to control. Make suggestions, yes. Influence, maybe. Control? Not even remotely. Case in point (which will get us to football in a moment)—you’ve probably heard or read a thing or two about the “tensions” in the Middle East recently. I can’t go into any detail, but suffice it to say, these events have added to my day here. Nevertheless, I waited anxiously for 1am on Sunday morning to watch the Florida-Tennessee game. It was supposed to be broadcast on the Armed Forces Network. There I was (actually working) with the TV on and the first quarter underway. Very excited since this game was a real test for the Gators—when in reality it wasn’t. I had my iced tea in a jug nearby ready to go and wanted to see what we could do. THEN AFN SWITCHED TO ESPN NEWS AND ALL I COULD GET AFTER THAT WERE THE HIGHLIGHTS!!! Really? After being up more than 24 hours, this was more than I could bear. All I could get was an occasional snippet and the score. Eventually, it go so boring that I went back to my room and went to sleep with the score UT 14 UF 10. Note: there were very few highlights to this point. Awaking at 6am—0600 for you military types or those who like the 24-hour clock—I decided that I’d check on the final score thinking it was somewhere around 24-20 given that there wasn’t much offense being played. For the second time in two straight weeks, with the Gators trailing at halftime on the road in hostile environments and playing like puppy poo in the first half, I miss the second half and an extraordinary effort by the Gators to finish the game. Tons of offense too! Who’d have thought that two weeks ago? Are you one of the millions of Gator fans who think that Will Muschamp has this team on the path to greatness? Well, I’m cautiously optimistic. I’m going to be a bit of a bubble-burster and tell you that UT still hasn’t become good enough to be on the top tier of the SEC. They are better than last year, but so are we and the results are similar. We need Tennessee to step up and be what they once were. Same for UGA. I’ll explain why on Wednesday. Here I was really upset that I stayed up and couldn’t watch the game and then finding out after the fact that we blew them out, which I have to admit was a nice reward for getting some sleep. I eventually made my way to work and went about my day. I have a monitor in my office hooked up to the local broadcasts which usually is tuned to the news—perks for being the #2 person in the organization. About 2pm on Sunday, lo and behold, what was this? A REPLAY OF THE GAME! Awesome! -Our defense has legs. They are playing hard through the 4th quarter. We couldn’t have even accomplished that until halftime last year. -I thought Jacoby Brissett was the future. Jeff Driskel is on a mission to prove me very wrong. -Every Gator across the world should thank Urban Meyer for signing Trey Burton, who has single-handedly affect more games for Gator Victories than any other Gator through these last (harrowing) 2 1/2 years. Too slow, no real position….just a football player. -Too many injuries against poor teams. Not good. -We’re coming from behind on the road, in big name stadiums with an unproven QB and a defense that has not allowed any points in the 4th quarter—-it’s ok to feel REAL good about this one! -Offensive line played well, but needs to get much, much better. Too much running around by Driskel, but I’m glad he didn’t get sacked this weekend…or throw an interception. -For Steve “Gator” Wood—Congrats on calling the right number of interceptions this past weekend. That puts us +3 in turnovers. -UT is not LSU…or UGA…or SoCar for that matter. We still have important games to play this season…..but they are all in Florida!! Things are looking up for the Gators, but there are miles to go in the season. Maybe we will even sell out for Kentucky? In all kinds of weather, Gator Fans. See ya’ on Wednesday. ‘Nuff said. This entry was posted in Uncategorized and tagged Florida, Florida Gator, Gator, Middle East, Tennessee, University of Florida, Urban Meyer, Will Muschamp on September 17, 2012 by TheGatorNarrator. Get fired up, Gator Nation! How do you scout a team that has a new head coach, a new offensive and defensive coordinator and a QB that hasn’t played one college snap at the position? Well, you don’t. I know we’ve watched films from Head Coach Kevin Sumlim’s teams at Houston—where Case Keenum put up astronomical passing numbers. We’ve been watching every other piece of footage from the rest of the coaching staffs’ history at their respective schools to prepare for a team that did not play last week due to Hurricane Isaac. The only thing we can really expect of a team that went 7-5 last year is something at least better than that. Their defense gave up LOTS of points, so the new defensive coordinator will have a challenge on his hands, particularly since they didn’t get their warm up game in before ours. Their QB, Johnny Manziel, has never taken a college snap. Hasn’t even seen the field during a college game. I’m going to say that this probably works in our favor, but let’s not get ahead of ourselves. Kevin Sumlim didn’t put up arcade level passing numbers for no good reason on his Houston teams. I would suspect that young Johnny can toss the ball around. Our secondary will definitely need to show up this week. There is reason for Texas A&M to feel good about this game. They are at home. We are away from our fan base at college game in Texas. We did not play inspiring last week and our passing game was not as expected. Oh, well, we’re gonna beat them anyway. I’m just chalking up last week to life’s little surreal moments and moving on this season. Our defense will demonstrate this weekend why it was highly touted coming into the season. We didn’t blitz last week and only rushed four, which I assume was by choice. If our front four get good pressure on the QB, our secondary should have a field day picking off some passes—-something I think we really all need to see. Mike Gillislee showed us the future for the season. I don’t know if he will get 24 touches this weekend, but I think 18-20 is doable. We will just have to see what he can make of it. I have to admit that it would be nice if we had someone getting 100+ yards each week. Jeff Driskel gets the nod at QB, but my gut tells me it’s only because he is mobile. Our offensive line really needs to exert its presence this week and push around what should be a small Texas A&M defense. I don’t like the new kickoff rule, but am still counting on Andre Debose breaking a kickoff for the distance. Now that he is returning punts maybe we will see the same on punt returns. I think we all need to see something new this weekend, Gator Nation. We’ve been waiting for this. It’s unrealistic to expect it to harken back to our National Championship teams, but I think we deserve more than the last two years. Our history is rocky in Texas (1-7-2…..2 ties, really???) and we’re only 1-1 against the Aggies, but an SEC reckoning is heading towards College Station. Florida 38 Texas A&M 24. ESPN Gameday is visiting with kickoff at 3:30pm EST, 12:30pm PST and some ungodly hour here in Kuwait. Before the season is out, I plan to make it to my local Gator Club, but I’m hoping you are at yours because Victory is best served with Gators! ‘Nuff said. This entry was posted in Uncategorized and tagged College Station Texas, Florida Gator, Gator, Texas A&M University, University of Florida on September 7, 2012 by TheGatorNarrator. One week left, Gator Nation! I’ll get more into football in the coming week. The fact remains we have no QB designated—though both promise to be GREAT quarterbacks. They are sophomores and at least this qualifies for one of my rules: The great thing about freshmen is that they become sophomores. Life can’t get any worse on offense than it was last year….can it? I don’t think it will be. We have far more depth on both sides than last year. The thing is….and this is hard to ignore…does anyone out there know what to expect this year??!? Information about the Gator football team has been about as minimal as I’ve seen in most years. The fact that Muschamp makes Nick Saban look like a blabbermouth is interesting. Makes me nostalgic for the Spurrier days when darn near everything he said was a riot….oh, yeah, we also blew teams out as well. So let’s start this season out correctly….we’re just going to assume the Gators are great this year and go from there. Game one will be over soon and we will definitely know more than we do now. We might even find out who the starting QB is going to be as well. Finally, let me address the question in the subject line. I’ve been in Kuwait (and other not so nice places) since January of this year. It has cut into my TGN time, but I’m trying very hard to be back with a vengeance. As such, I’ve decided to get serious about this whole Gator Narrator gig. I like writing the weekly posts and reading up on the Gators from week to week. It’s about time I’ve managed my operations with it better. Usually this is just something I draft up and send out in my spare time. Since I’ve been in the desert, I’ve been using a WordPress site to tell my tale here in the Middle East. I believe many, if not most, of you are on it. It really is user friendly and not as controlling like Blogger and other sites. I thoroughly enjoy its functionality. So, I’ve setup shop there with my own TGN page (link below). It is currently a work in progress, but all these emails that go forth will be posted there, so if you sign up you can watch it mature…and that’s pretty much why I’m telling you this. I’m going to stop the email distribution and utilize the function on thegatornarrator.com to distribute my weekly musings. I’ll keep this email distro up for awhile, but eventually it will go away. This will also give you the opportunity to be released from the distribution if you choose—no worries, my feelings won’t be hurt, if you’re not reading, you’re not reading—just a fact of life. For now things will stay the same, but changes they are a comin’! I hope everyone is enjoying their Gator Kickoff parties this August. I’m looking forward to seeing what we can expect next week. It’s going to be an exciting season. Hopefully, you’ll join your fellow alumni at your local Gator Club where Victory is best served with Gators! ‘Nuff said. This entry was posted in Uncategorized and tagged Florida Gators, Gator, University of Florida, Will Muschamp on August 24, 2012 by TheGatorNarrator.